Removes Dingies Bleach & Oxis Can’t! Are your white clothes not-so-white anymore? 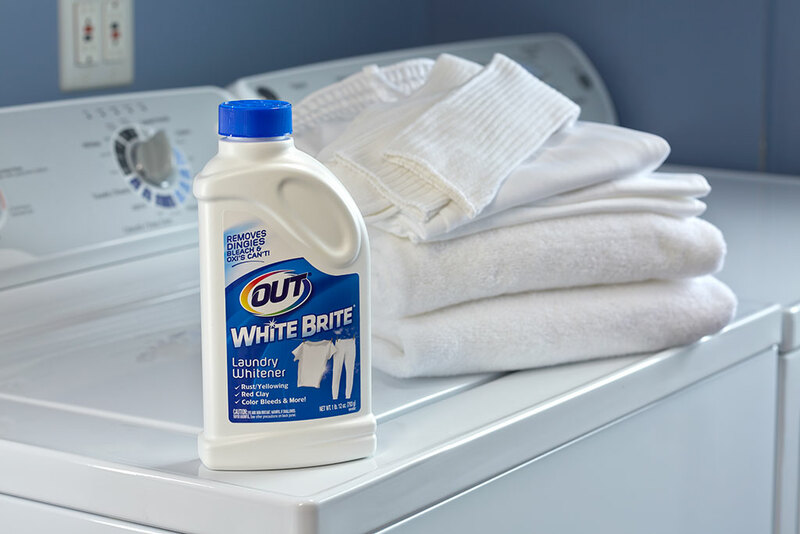 OUT® White Brite® Laundry Whitener brightens and removes the dingies bleach and oxis can’t. 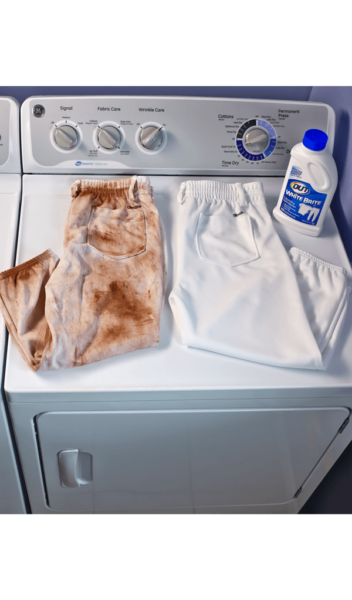 Dingy whites caused by rust stains and yellowing, stubborn red clay and red dirt, unfortunate color bleeds and even iron-fortified baby formula stains have all met their match with this effective laundry whitener. Ideal for regions with high iron and red clay, White Brite eliminates stubborn red clay or red dirt stains. It works great on white baseball pants and other white sports uniforms, and it also reverses unfortunate color bleeds. White Brite is safer than bleach for use on white and colorfast fabrics, including delicates, and can safely be used in all washing machines. White Brite delivers the results you are looking for…cleaner, brighter, fresher laundry! Available in 1 lb 12 oz and 4 lb 12 oz sizes. 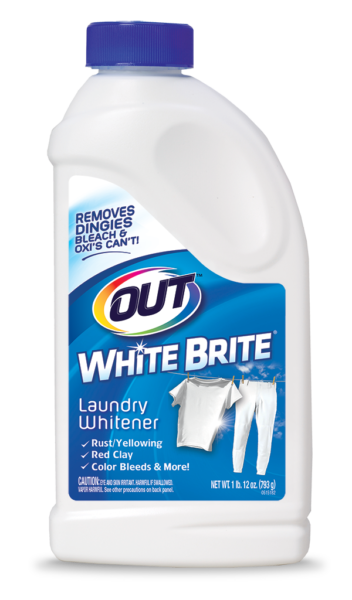 White Brite is uniquely formulated to whiten and brighten white clothes more safely and effectively than bleach or oxi. It removes yellowing and rust stains caused by iron and other water impurities, eliminates stubborn red clay stains and reverses unfortunate color bleeds. 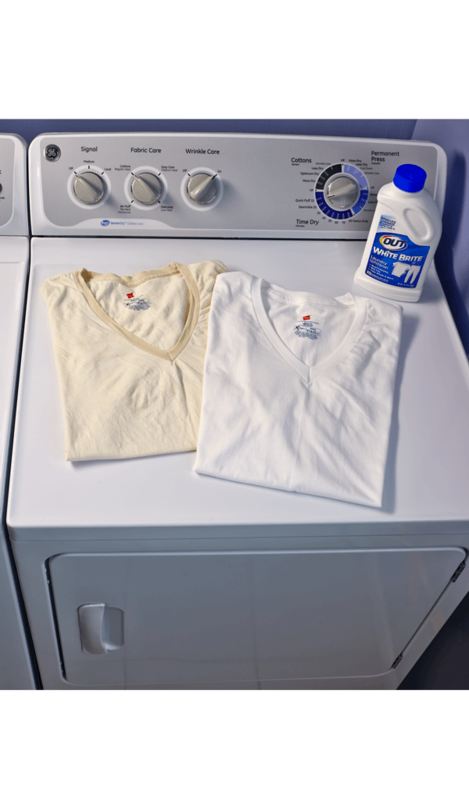 White Brite makes dingy whites bright again and keeps them looking new. How Often to Use: Use OUT White Brite with each laundry load or as needed to whiten and brighten. Non-Compatible Surfaces/Materials: OUT White Brite should only be used on white and colorfast fabrics. It may have the ability to cause irreversible damage to embroidery. Test in an inconspicuous area before use. 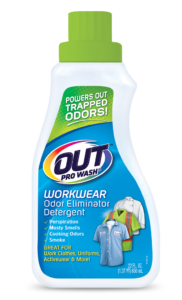 Do not mix with products containing bleach or peroxide, including OUT ProWash Workwear Odor Eliminator. Safe for use in all washing machines, including HE, and with septic systems. Read entire label before using. DO NOT USE with peroxide, bleach, bleach-detergents, oxi-stain removers or oxi-detergents. Fill a plastic container with 1 gallon of warm water and add 1/2 cup of White Brite. Soak stained white clothing in solution for 20 minutes*. Remove and wash as normal. *For stubborn stains increase dosage and/or soaking time. Add 1/2 cup of White Brite to warm water as washer is filling (for front loading machines add White Brite to the detergent drawer). Once washer is full, add clothes and let soak for 5 minutes (if possible, with soak cycle or by stopping machine). Add detergent and wash as normal. Do not use with peroxide, bleach, bleach-detergents, oxi-stain removers or oxi-detergents. Use with adequate ventilation only. 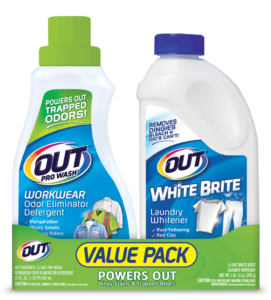 + What does OUT® White Brite® do? OUT® White Brite® is a unique, multi-purpose laundry whitener designed to remove dinginess, yellowing, rust and hard water stains, iron-fortified baby formula stains and stubborn red clay and red dirt stains. 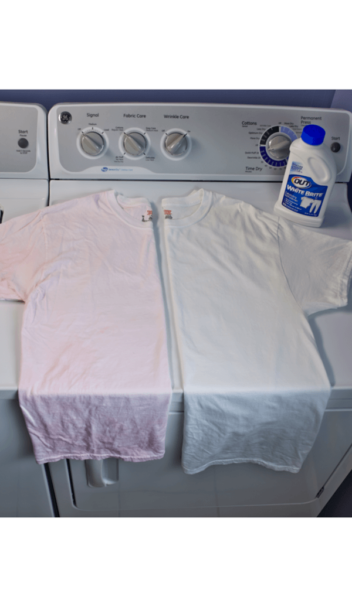 OUT White Brite also reverses dye stains caused when whites and colors are washed together. OUT White Brite is safe for whites, delicates and colorfast fabrics and is more effective and safer than bleach. + Can I use OUT White Brite with my detergent? OUT White Brite can be used with regular detergent. However, DO NOT MIX White Brite WITH BLEACH OR PEROXIDE or OXI-STAIN REMOVERS or OXI-DETERGENT. + Where can I buy OUT White Brite? + How long can I let my white clothing soak in OUT White Brite? White clothing can soak in OUT White Brite until yellowing is gone. We recommend 20 minutes. Stubborn stains may require additional soaking time, even as long as 2-3 hours. Do not soak longer than necessary. + Can I use OUT White Brite on colored clothing? Each colored item is first tested to determine colorfastness of the dye, which will avoid bleeding or discoloring. If acceptable after testing, wash each item separately using the instructions for white clothes. Note – this product may permanently damage colors, embroidery and logos that cannot be corrected. + What types of washing machines can be used with OUT White Brite? When used as directed, OUT White Brite is safe for use in all washing machines, including top loading, front loading and HE, and will not harm the washer tub, surfaces, hoses, detergent dispensers or any of the components. White Brite is plumbing and septic safe. + Can I use OUT White Brite to whiten and brighten something besides clothing or laundry? 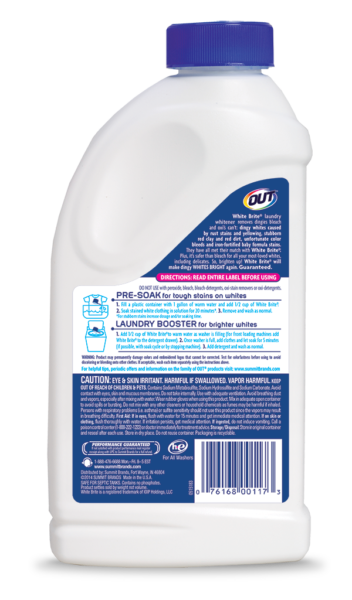 OUT White Brite has only been tested on laundry as a fabric cleaner and is not intended for other types of cleaning. + Is OUT White Brite septic safe? When used as directed, OUT White Brite is safe for all plumbing and septic systems. + My clothes are still stained even after using OUT White Brite. For best results, we recommend diluting White Brite with warm to hot water to fully activate the whitening agent. Due to many factors such as the stubbornness of the stain and the fabric content, it may be necessary to increase the directed dosage and soaking time in order for the stain to be removed. If necessary, we advise increasing dosage by 1/2 cup and increasing soaking time an additional 30 minutes until stain is removed. + OUT White Brite turned my clothes blue. What do I do? OUT White Brite cannot create color. If any of the laundry was colored and contained dye, including off-white colors, stripes, tags, embroidery or logos, White Brite may have pulled color or dye and re-deposited the dye on other fabrics within the load. If the clothing was all white, sometimes the product can pick up on blue dyes present in a detergent or liquid softener. We recommend washing your clothing again using only OUT White Brite and use a higher concentration (1 to 1.5 cups of White Brite). Increase soak time to 45 minutes and allow the washing machine to run through an entire cycle, using only OUT White Brite. + After using OUT White Brite in my front load washer, there was foam everywhere. Will this foam ruin the washing machine? OUT White Brite is not formulated with a surfactant or foaming agent. It is likely the foam was caused by the laundry soap or softener. The foam can simply be wiped out. + OUT White Brite turned my clothes a pinkish-orange color. What do I do? This was likely caused by a reaction of iron-rich water and sunscreen, not the White Brite itself. Sunscreen includes an ingredient called avobenzone and it is responsible for causing the staining on the clothing. You will not see the stains until you wash because it is the reaction with the iron in your water that causes the stains. Unfortunately, there is no remedy that can be advised to reverse this currently. The best solutions is to use a product like Iron OUT® to remove the iron from your water, and then hand wash items that have come into contact with sunscreen with the iron-free water. + What happens if OUT White Brite is accidentally mixed with bleach? If OUT White Brite is mixed with bleach or peroxide, a chemical reaction resulting in fumes may occur and OUT White Brite will be ineffective. Open the nearest window and ventilate if fumes are formed as a result of mixing. + Will OUT White Brite put holes in my clothing if used often? When used as directed, OUT White Brite is safe for use with all fabric types and will not attack the clothing fibers like bleach or peroxide. + Can I use White Brite in an HE washing machine? When used as directed, White Brite is safe for use in all washing machines, including front loading, top loading and HE machines. Refer to the label directions for usage instructions and dosage. + What type of container should I use when soaking clothes in White Brite? For best results, we recommend soaking items in a colorless plastic container, bucket or a utility sink. 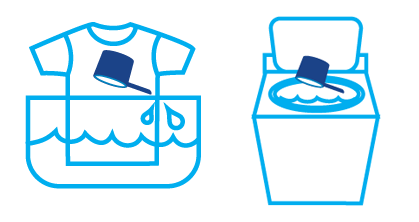 Items may also soak in the washing machine after the tub fills by pausing or stopping the machine before the wash cycle begins. Depending on the nature and stubbornness of the stain, we recommend soaking for 5 – 30 minutes and no longer than necessary. + What water temperature should I use with OUT White Brite? For best results, White Brite should be used with warm water, which allows the chemical to completely dissolve and fully activate the whitening agent.